No wonder since the curator goes by the name of Coskun Gueven. After putting together projects such as Circus Maximus and the Big Geezers Tour for Carhartt he’s about to take it to another level with his very own gallery. Known within the daily reinventing art scene he is offering public a guiding hand through the twisted world of art as well as new artist a space for their work and invites newbies and established artists he has met on the path that led him to open Arty Farty. 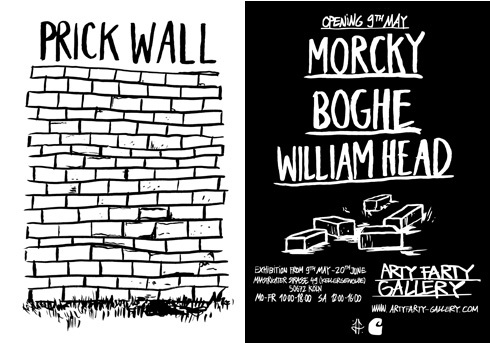 The first exhibition is called The Prick Wall and the responsible artists behind it are William Head, Morcky, and the Boghe. Please check out Arty Farty’s picture gallery for more images and get your frequent updates from their blog.